Where do you get Ultra-bio? Last edited by justthewife; 01/19/2016 at 09:44 AM. I run 80 watts of UV continuous on my reef. I change the bulbs every 8 months. UV won't put a dent into dinoflagellates. I wish it would work but it won't. Biodiversity won't work either. I have very strong biodiversity in my reef system. Reef Diva, I don't mean to be rude but are you sure you have dinos? Cyano can look very very similar, and it likes higher nutrient conditions like you'd see after a crash. UV probably wouldn't kill cyano as it's not floating around the water column at night. Biodiversity with respect to dinos means microscopic flora and fauna, pods, sand bed organisms, etc and supplying enough food to sustain them. "No magic bullet, use a multi-pronged approach" could be the theme song of this thread, unfortunately. That's not a stupid question at all. You're seeing bubbles because your lights were on longer. Not to get into a big biochemistry discussion, but yes, too long a light period can harm photosynthetic organisms. Will it hurt dinos more than your SPS? I don't know and I *definitely* wouldn't risk pushing the photoperiod too much at once. Not a silly question at all. it's a mixture of bacteria, TBH, I suspect anything that increases the variety and number of bacteria and other micro organisms would benefit the fight. Personally I'd ditch the UV, it's indiscriminate and you want to increase the competing bacteria etc in the water column. The dinoflagellates would disperse into the water column with a blackout anyway, use the skimmer and siphon to remove them. the tank acting as a scrubber of sorts hold some merit. When my Dino problem was bad, I took out all corals and the dinos got out of control. The tank that the corals were placed in initially had a dino problem, but that eventually sorted itself out. The bacteria is primarily in the filter media - sand, rock, plumbing, surfaces... They're not in the water column like dinos. Sure, they'll get killed too if they go in, but dinos have the unique behavior of free floating in the dark. This makes them especially vulnerable to UV with a protracted lights out phase. But as the dinos die, they need to be exported out - wet skimming. They also leave a hole in the ecosystem that must be filled by other organisms. I don't think bacteria is the answer. I added phyto myself. But bacteria may be part of the answer too. I also added pods, live rock, live sand (yes-really), new chaeto, and fed... Once the dinos were being killed, I wanted to give every other competing organism a chance to fill the void in the food chain! I threw the kitchen sink of life at them wanting to introduce any element that could outcompete them. I even bought the most invasive photosynthetic corals I could- rhodactis on two massive pieces of live rock covered in worms and sponges. Yes- I introduced aggressive corals in the middle of the Dino fight. Something won out in the end- but I can't say what it was. I just know that my chaeto started performing again and I began exporting. I even added an ATS and the algae fills up like a machine now and I feed heavily but export very hard too. Don't do a 3 day. It wont work. Others who have tried this have even witnessed the dinos coming back together in the water column when the lights come back on. 8 days minimum (I think I did 10) *complete* blackout (including sump, grow lights etc) with the tank covered, then slowly bring in blue-lights only over the next two weeks before introducing white WILL kill off nearly all of them. Don't do half measures. at 4/5 days, I still had dinos clinging on, they were certainly in the water column past this time. UV worked for me on one occasion without the dirty method so it most definitely is a viable option. There is enough bacteria on the surface area of the rocks and sand that you are not disrupting the bacteria population by zapping a few in the water column. A skimmer by itself isn't enough to eradicate dinoflagellates or this thread would never have reached 100+ pages. I agree that the nitrogen cycle bacteria live mostly on rock surfaces, so UV is safe in that regard. How long have you been trying this approach? Are any corals or other animals having trouble? I don't have dinoflagellates. I posted a cure for dinoflagellates which took me a hour to compose and which does work based upon the writing of Randy Holmes Farley. If anyone seriously wants help with this problem, then send me a message and I will tell you what to do. I am going to tell you it is a lot of hard work and it is not what I posted. Last year I had a client's tank crash because they turned off the heat in the entire building and the room went down to 40 degrees. Needless to say almost everything died. All the rock became covered with dinoflagellates. I took all of the rock home and put them into a 90 gallon tank, no fish, no coral, good flow, new, clean water, LED light and watched the dinoflagellates thrive for months. I kept turning the lights on for a few weeks and off for a few weeks. Got nowhere. Finally I left the lights off for several months. Finally after 1 year it appears that the dinoflagellates are finally gone. Is anybody really scared now. Because this little experiment really blows my mind. This is how insidious dinoflagellates can be. Well, I probably would find some other approach at this point, but this method might work given more time. 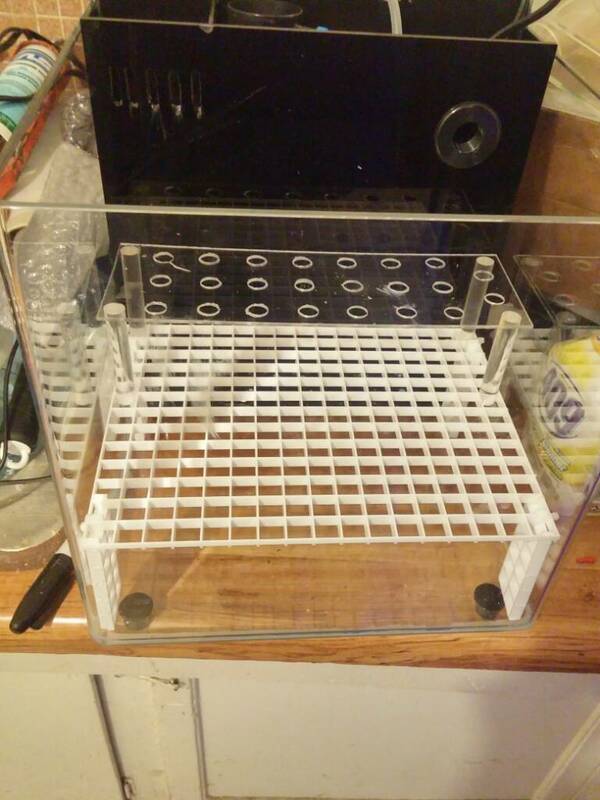 Porkchop mentioned a 3 day black out just to knock them back..thats what im thinking..but first im setting up this small frag tank im putting together move some frags then black out my tank. You've only been doing the dirty method for five days according to your post two days ago saying you'd been doing it for three days. Maybe you should give it more time? I agree. I've been purposefully keeping my tank dirty for maybe 6 weeks now? 5 days of the dirty method didn't do anything for me. 6 weeks later I'm seeing almost no dinos, but cyano showed up for the first time. Which in my opinion is good...cyano is less of a headache than dinos are for me. It's hard, but my and other's LPS and SPS came through. I have spoken to several people who have had dinos return en-mass after 3-4 day blackouts, and 8+ days worked for me, dino's were still present after 3 days. So what is "the real attack"? Have I missed something? The idea of the approach I successfully used was to create such a hostile environment to dinoflagellates using multiple factors that the dinos die off and are exported without adding to the problem. If you simply knock them back a bit, you risk having a gap created in the ecosystem and significant numbers of dinoflagellates that can multiply to fill it. I'm not sure you intended to, but your post suggests that the dinos came back as you stated it's worked for you "every single time?" Same tank or different tanks? You also rightly suggest that I do not know what species of dinoflagellate is in the tank, I would suggest this is true and by that same notion, you have no clue if a 3 day will work against the species being dealt with. What I am trying to emphasise is that this is a heavy undertaking and one that you don't want to go through twice. It's the reef owner's problem, so the risk is up to them and should be weighed up on an individual basis. Last edited by tastyfish; 01/20/2016 at 12:29 PM.